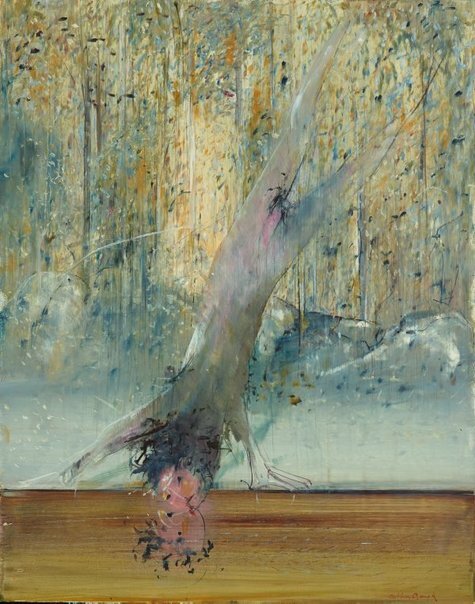 Arthur Boyd first visited the Shoalhaven region of New South Wales in 1972 and was immediately struck by the distinct beauty of the landscape. He began plans to purchase a house in the area, a project realised by the late 1970s when the Boyd's acquired ‘Riversdale’ and later 'Bundanon', the striking 1,100 hectre bush land property on the Shaohaven River. By the late 1970s the features of the Shaolhaven landscape; one that Boyd referred to as "the only untamed landscape I have ever seen", became a consisent presence in his work. He drew on the essence of scrub and land forms, and the otherworldly qualities he detected in the pristine landscape and used these elements as backdrop to a series of mythological and allergorical paintings including 'Narcissus reflected' 1976. In this finely wrought work, Boyd builds up suggestions of place, myth and mystery through calligraphic mark making, and a high-keyed palette of blue, pink and purple colouring that he sourced from the Shoalhaven landscape and are evocative of a twighlight hour. With the figure's dynamic, diagonal thrust, Boyd suggests Narcissus as elemental force, emerging from the landscape like a bush sprite. The work is indicative of Boyd's pairing of elements of myth and place to offer a distinct interpretation of classical mythological narratives. Signed and dated l.r. corner, red oil "Arthur Boyd". Not dated.